Forget pina coladas and towering white cakes—coconuts have come into their own. These days, you can’t walk the aisles of a supermarket or health food store without seeing a huge array of coconut products, from rosy pink young coconut water to tangy vinegar. But unlike a lot of passing food fads, these tropical wonders pack a powerful nutritional punch. Coconuts are actually not nuts at all—they’re the fruit of a palm tree, and technically known as ‘drupes.’ Coconuts contain many nutrients, iron, magnesium, calcium and even vitamin C, but their high fiber and potassium content are especially important. Both are recognized by the USDA as shortfall nutrients, which means many people don’t consume enough of them. Coconuts are also high in antioxidants, which mop up harmful free radicals and help prevent chronic diseases like cancer and heart disease. In addition, most coconut products have a low glycemic index, which means they don’t impact blood sugar levels as much as those with a high glycemic index. Why is that important? Foods with a high glycemic index can cause spikes in blood sugar which not only makes you feel lousy but over time can increase your risk of weight gain and diseases like type II diabetes, heart disease, macular degeneration and some cancers. Even better, when incorporated into a recipe, they lower the glycemic index of that recipe too; banana bread made with coconut flour has a lower glycemic index than bread made with all-purpose flour. A lot of the buzz surrounding coconuts comes from their medium-chain triglycerides (MCT). This type of fat israpidly metabolized in the liver so it’s immediately available as an energy source; it’s also easier to burn off and harder to store as fat. Some MCT, like lauric acid, work to keep you healthy by eliminating disease causing microbes and lowering inflammation, an underlying cause of many diseases. Coconut oil is one of the main dietary sources of MCT—about 65 percent of its fat comes from MCT, and almost half of that is lauric acid. Coconut flour: Made from dried, de-fatted coconut meat, coconut flour is low in carbohydrates and high in both soluble and insoluble fiber. It lowers the glycemic index of a recipe, while the fiber helps lower your cholesterol and triglyceride levels. Coconut oil: This oil is derived from the meat, and is high in lauric acid, the medium chain fatty acid which raises HDL (good) cholesterol levels. It is excellent for cooking and baking, especially for those looking to avoid dairy products. Coconut butter: This creamy spread is created from ground coconut meat. It’s got a nut-butter like consistency and is a good source of fiber. Coconut vinegar: Boasting an impressive array of vitamins, minerals and polyphenols (a type of antioxidant), coconut vinegar is low on the glycemic index and helps prevent blood sugar spikes after a meal. Coconut vinegar even has antimicrobial properties which help keep foods safe. Just starting to explore the world of coconut? 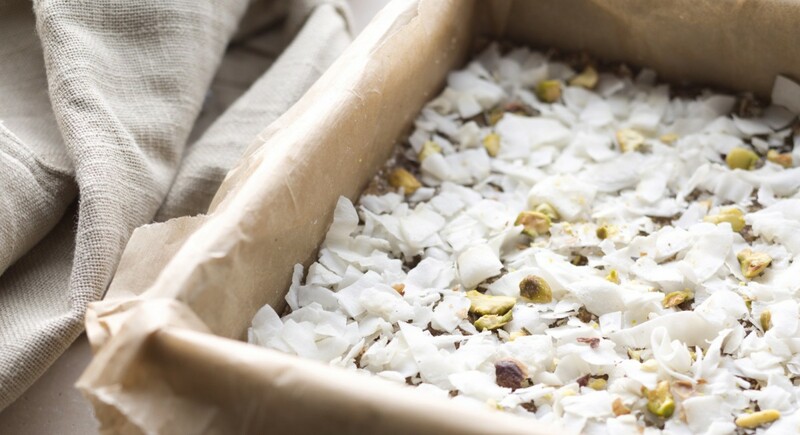 Try your hand at making these toasted coconut bars. The healthy oils protect your heart and boost your metabolism, but it’s the rich, sweet flavor (think cookie dough!) that will win you over. You can whip them up in just a few minutes time, and keep in the fridge for a post-workout treat. ← Rub Epsom Salt In Your Hair And This Will Happen. AMAZING!